I’d been waiting for that hokey sales pitch since last summer from my favorite Brentwood-based corn vendor at our local San Jose Blossom Hill Farmers’ Market. If his corn’s flavor is as vibrant as my mother-in-law’s personality was, then it must be pretty darn good! And nothing sounds more like summer than the crunch of a fresh ear of corn. Another star of the July farmer’s market is the tomato with a depth of flavor like a big old cabernet. 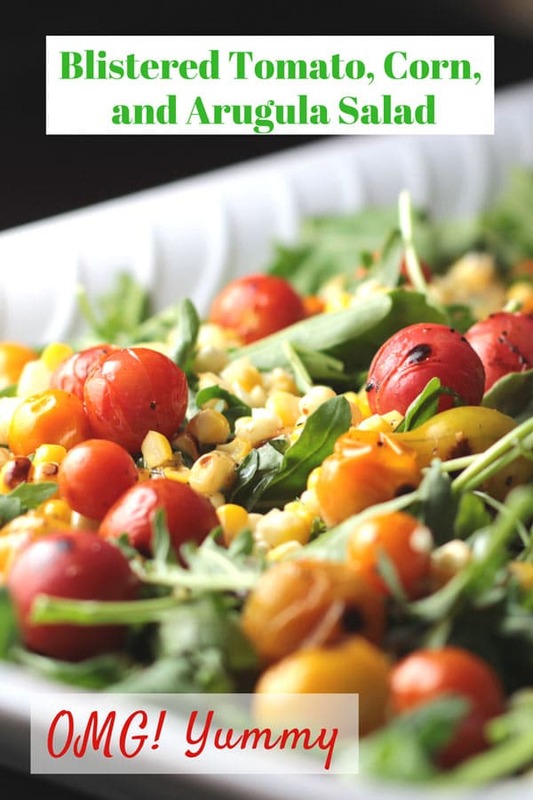 Combine these two treasures – fresh corn and tomatoes – with some peppery arugula and a smattering of fresh basil and the result is this simple but sumptuous blistered tomato, corn, and arugula salad. 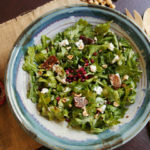 Serve this crunchy, flavorful salad as a side dish at your next barbecue or even as a base for grilled steak, creating a version of my grilled steak and arugula salad. Among the many benefits of shopping at my local farmers’ market, the freshness of the produce and an opportunity to support local vendors are my top two reasons. But if I can’t get to a market, I still look for locally-sourced produce at the supermarket. I’m lucky enough to have a grocer close by, New Seasons Community Market, that offers many locally-sourced fruits and vegetables. You can see in this photo, that I was able to pick up everything I needed for the salad with assurance that it was from a local grower. 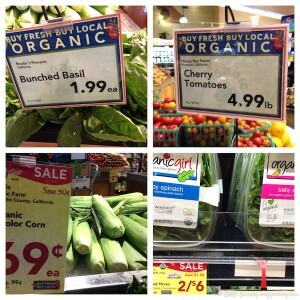 Even in large chain stores, you will often see items marked as originating from local farms. Read the signs and support your local growers as much as you can! 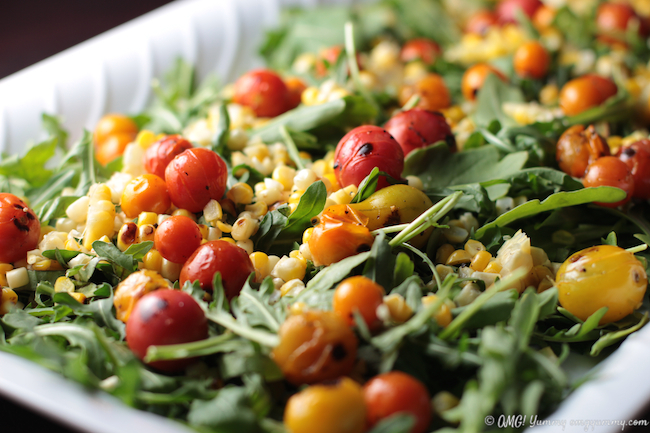 To add a layer of flavor to this tomato, corn, and arugula salad, I charred up the corn and tomatoes in a cast iron pan. You can easily do this on the grill if you have it fired up but I am currently having a bit of a love affair with my Lodge Cast Iron Skillet and decided to do the charring or blistering a bit earlier than the outside grill was ready to go. 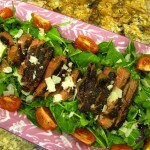 The dressing for this salad is basic balsamic vinegar and extra virgin olive oil. You can add in a bit of the fresh basil as well. 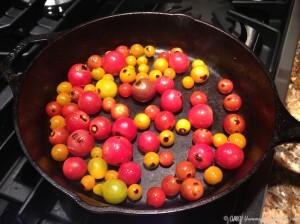 But the flavor of mid summer corn and tomatoes is so deep and rich that they need little adornment to be superstars. I hope you add this simple salad into your summer rotation along with all the other enticing dishes in this Farmers’ Market Dinner Party. Be sure to head over to these other blogs to see what they brought to the party and find some more yummy farm-to-table inspiration. What’s your favorite find at the farmers’ market right now? 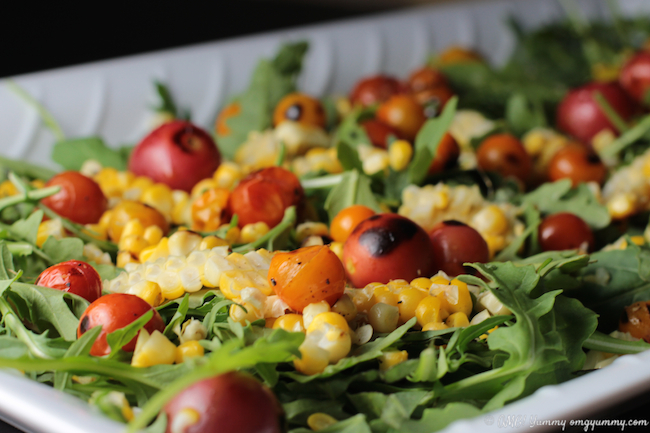 This simple salad that combines just four ingredients - tomatoes, corn, arugula, and basil will become a staple at your summer barbecues. It makes a beautiful buffet presentation or works just as well on an individual serving dish and it all comes together in very little time. In a small bowl, whisk together the oil and vinegar and then add the salt and pepper to taste as well as a bit of chopped basil if you are using it. Set aside. Heat your cast iron pan to medium (or use your grill). While it's heating, brush the olive oil on the corn and sprinkle with salt and pepper. 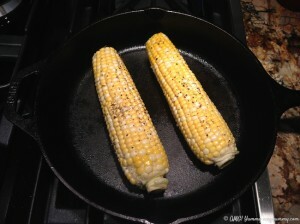 Place the corn in the cast iron pan or on the grill to create a char all over. This will take about 5 minutes. After you take the corn out of the pan or off the grill, put in the tomatoes and do the same thing but this will happen quickly - maybe 1 or 2 minutes at the most. Take the tomatoes out of the pan. Once the corn is cooled, use a sharp knife to take the corn kernels off the cob. It's ok if some of them remain stuck together, it looks good that way on the salad. 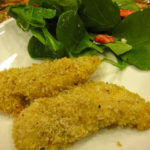 Chop or tear your basil into bite size lettuce-like pieces. To assemble your salad, place the arugula and basil on the plate first. Then top with the corn and tomatoes. Sprinkle a bit more salt and pepper on the salad if you like. Dress it right before you serve it or pass the dressing separately. If you’re interested in the gluten-free menu presented by the other Bay-Area Food Bloggers group, go check out these posts! Now that the BBQ season has officially started, this will really come in handy! 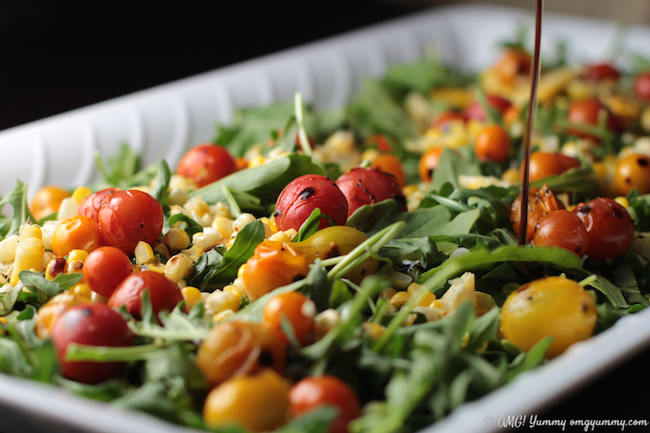 It’s really convenient that you throw some corn and tomatoes on the grill next to the steaks/burgers/fish and prepare a smokey-tasting delicious salad at the same time. Just reading your comments lifts my energy – you guys are so great. What I wouldn’t give to get a Greek cooking class from you two! I’ll trade Middle Eastern knowledge for your Greek expertise – deal? And you are right, that this recipe is so in season now – I just love the flavors of seasonal ingredients in their prime! Regarding the seasonal ingredients…we just came back from the farmers market with some fresh organic tomatoes, zucchinis, eggplants, avocados etc. Actually farmers markets are a huge deal in Greece and they must’ve been in NY where you grew up, right? 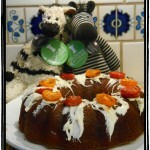 Are there farmers markets popular in San Jose? 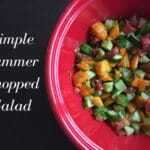 This is a perfect Summer salad. love the dressing.. delicious! ! In the summer especially, simpler is better. No need to get fancy – it’s all about the ingredients in their natural form! Thanks for coming by Arpita. 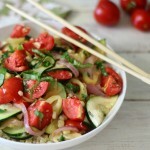 Beth this is an utterly glorious summer salad, and now you have me longing for summer days. We still have a month of winter to get through, but days are getting longer and warming up already, and the first of my broad beans in the garden has popped it’s little head up, so it’s nice to feel that spring is just around the corner. Hi Sue! I always do a little happy dance when I see a note from you! I did think about you and other southern hemisphere readers when I wrote this post but we will be having the same pangs in a few months when your summer is in full bloom! I hope your winter has been mild and more comforting than harsh. I think of our lunch fondly and hope you will be here for a visit next year. If so, how fun would it be to cook together?! 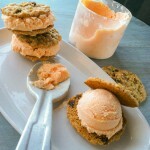 If you have time in your schedule, maybe we can indulge! Beth, we have been very lucky with a relatively mild winter by New Zealand standards, and having had three days in the last week when I didn’t have to wear my overcoat, I’m hoping that I might be saying goodbye to winter boots in another week or two. Certainly, there are daffodils out everywhere, and the first of the apple blossom is starting to appear. Spring lambs everywhere too. This time of year always does my heart good. Oh gosh, while your daffodils are blooming, our grass is dying of thirst and we are watching the fall decorations arrive in the stores. I truly hope you make it back next year and we will most definitely cook together if you do. That date ice cream was a knock-out. You are truly so creative Sue. It always spurs me on to reach a bit higher! Wow, Beth this is so beautiful and colorful and fresh. The virtual Farmer’s Market Dinner was a success. I hope we do it again. Me too Marlene! Thanks for stopping by. I just added all the links to your groups’ recipes as well! Yum! Your salad looks just incredible! Simply perfect for the summer! I love tomatoes and corn together! Great salad! I will have to make this recipe soon! Everybody’s contributions were inspirational and creative. I hope we can have one of these virtual dinner parties in person sometime soon! 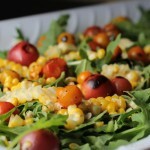 What a beautiful expression of summer in a salad! Can’t beat that Brentwood corn and it’s really sweet and flavorful right now. 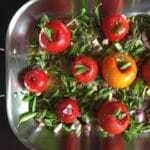 I love it charred and it looks like a perfect addition to your salad. Happy farmers’ market summer! Same to you Jennie. Can’t wait to dig into some of your ice cream recipes. 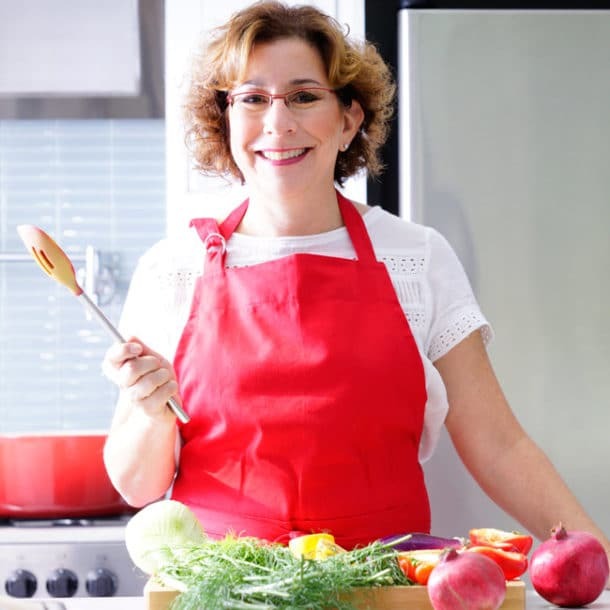 It’s a pleasure getting to know all of you and I look forward to meeting you all and cooking in person! Such an appealing salad! You have captured summer-on-plate, bursting with seasonal flavor and easy to prepare. When I’m in Santa Cruz I often stop at New Leaf. The Westside store is a favorite! We are lucky to have our own New Leaf walking distance from the house. It’s such a great back up when I miss the farmers market. Plus I love how they take care of their produce section – such a labor of love! Hope to find a way to meet up with you in Santa Cruz or Aptos sometime soon Deb! What a beautiful and delicious dish Beth! Oh my, I can’t wait to make it and I know The Artist and I will both love it!! I just love the tastes of summer and the fact that so often, the ingredients need little to shine. What a great idea these dinner parties are – cheers to Renee for putting it together. I will be heading over to check out your menu soon! 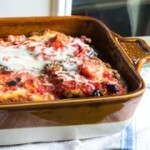 This looks gorgeous Beth, and such a terrific way to celebrate summer’s bounty at the farmer’s market. What a fun project this was for all of us!! I agree Susan and I am so pleased to get to know more Bay Area bloggers, even if only virtually for the time being. All of your work is inspiring and I can’t wait to meet in person.